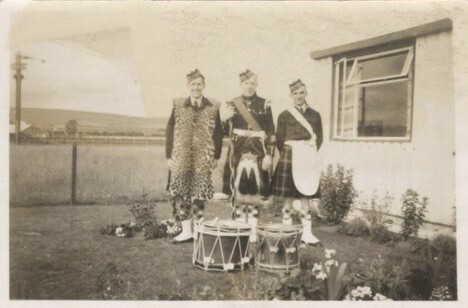 Left to right: Johnny Lennox, Alex Urquhart and Davie MacKenzie at Golf View Terrace, Invergordon. Johnny Lennox, married to Jean, came to Invergordon in the RAF during the War. The year for the picture should be 1950s. 1st. right is my uncle David Mackenzie. My great Uncle was also called David Mackenzie but known as "Big Dave" to differentiate. He had the grocer's shop next to Billy Clark's shoe shop on the High Street where Somerfield's is now. I remember Dave MacKenzie very well. When I was a toddler, a rendition of "You are my Sunshine" guaranteed me some free biscuits every time I went into the shop......not to be sniffed at in those days of rationing. Dave was fond of a drink and he used to smuggle me into the Lounge Bar of the Royal for a lemonade or two. A very nice man from the days when men could be friendly to children without any fears that they were unsafe. I, as a child, shared an air-raid shelter with Dave and a man called Frank who worked in the hardware shop. Many nights were spent there. Dave was just great, very kind and always had a apple or some treat for me. Frank was always reading his bible and sniffing Vicks up his nose. As a child, he seemed a bit scary to me. My Mother stayed outside the shelter watching the dog fights in the sky. Audrey, have a look at picture #615 where there is a discussion about "Frank". Hi Audrey - I remember Frank well also. His name was Frank Graham. He worked in the Hardware shop, Gilbet Ross, beside my stepfather Angus Mackenzie. He stayed permanently in the Salson Hotel in 1959 when we first arrived in Invergordon. As a child I got to know him quite well, due to staying there for a time also. He wasn't scary (although I can understand as a child you perhaps thinking this) at all - just a very private man and deeply religious. When my father, Captain Frederic Booth died, Frank wrote my mum, Fay, the most beautiful letter, which I still have. Correct date for this photo would be about 1952. Dad left for West Australia in 1953 and Mum and I followed in 1954. Hello Douglas, my name was Anne James and I lived next door but one from you in the prefabs in Golf View Terrace where this photograph was taken. I was 10 years old in 1952 when you left Invergordon and I remember you were a few years younger so you may not remember me. Your Mother and Father will remember my Mother Nanna James. Mam is 84 years old now. She lives in Swindon, Wiltshire, and still goes up to Invergordon every year for her annual holiday. I tried to contact Noreen Gunn recently; she lived next door to both of us but I have had no reply. I remember we all used to have lots of fun playing rounders with our parents in the field opposite our houses. Anne, Noreen Gunn has been living in Australia for the last 30 years. I had an email from her daughter as Noreen is not on the net. It's always good to see your name here. I am going home next month and I am really looking forward to it. Please give my love to your Mother. Hi Anne, my Dad - Johhny Lennox - is 87 this year. He lives with my sister Barbara at Allanfearn near Culloden - still has the leopard skin I believe! I believe I remember you - I think you and lass called Ishpael(?) taught me to ride a bike up and down Golf View Terrace when I was about 6 or so. I ve just seen the comments on Gilbert Ross's Ironmongers. Is Angus Mckenzie still around? If so, can you give hime my regards as I used to work with him and Frank before going to take up a job at Invergordon Station? Hi Doug, thank you for your response. The other person you mentioned could have been Ishbel Mackenzie (her father is on the photograph with your father). Ishbel lived in the prefab next door to you on the other side (the prefab is in the background of this photograph). Ishbel is a cousin of Rosalie Samaroo(Graham) who also responded to my comments about Noreen Gunn. Ishbel is also on picture #875. I have since spoken to my Mother about your parents and she said when she was young she had lots of fun with your Mother and she was very interested to hear of your Father's whereabouts. Mam said to send him her regards. Just thought I would let you know Doug, that my Uncle Angus MacKenzie died a number of years ago. He and his wife Fay moved to Glenrothes, Fife. Angus has a brother Kenny and a sister Isabel (my mother) who still live in Invergordon. Angus also has two sisters Jess, who lives in Errol, Perthshire and Nan who lives in Edinburgh. Hi Doug, you won't remember me but please give my best wishes to your dad Johnny. We have photos somewhere of your parents and my parents at the prefab if I can find them. I used to see your dad quite often when he lived in Barbaraville but I moved south 7 years ago. I remember you in school with Grant Boyd, who is a distant cousin of mine, and your art class doing a mural on the wall outside Miss Crystal's class in the Cromlet building. Hi Liz, Anne, John and everyone. Thanks for your good wishes. Johnny Lennox is not exactly an Internet geek, so I shall print this page out and mail it to him (from Aussie). Regards. I found the page very interesting as the Frank Graham who was mentioned is a relative of mine. I visited Invergordon to see Frank's and his parents' graves at Rosskeen church in 1999. Anyone who could give any info on Frank would be appreciated from family in Canada.